Methi Matar Malai...For some reason I find the name quite stylish and interesting. Maybe because of the alliterative nature of the name, this dish, simply seems to stand out. To me, this recipe is an all time favorite. 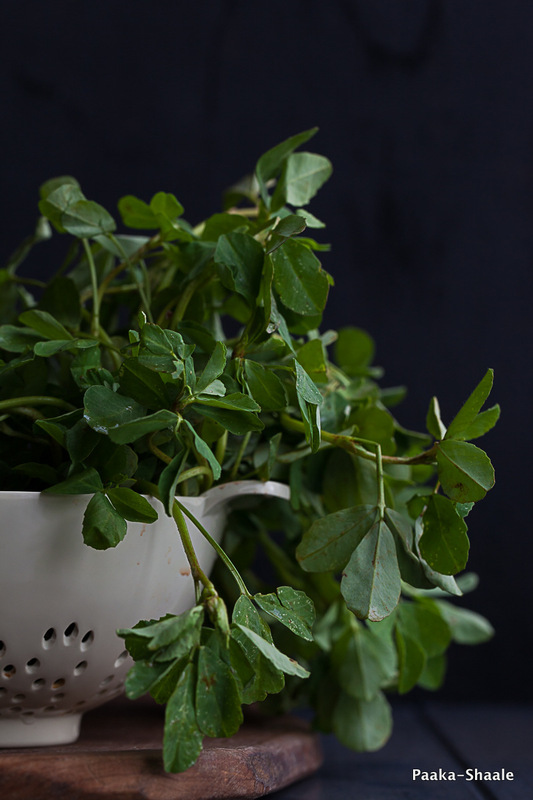 I just love the way the bitter fenugreek leaves compliments the sweet green peas. If you are looking for a dish that is rich, creamy and an indulgent dish that makes you feel pampered then this dish is the one. 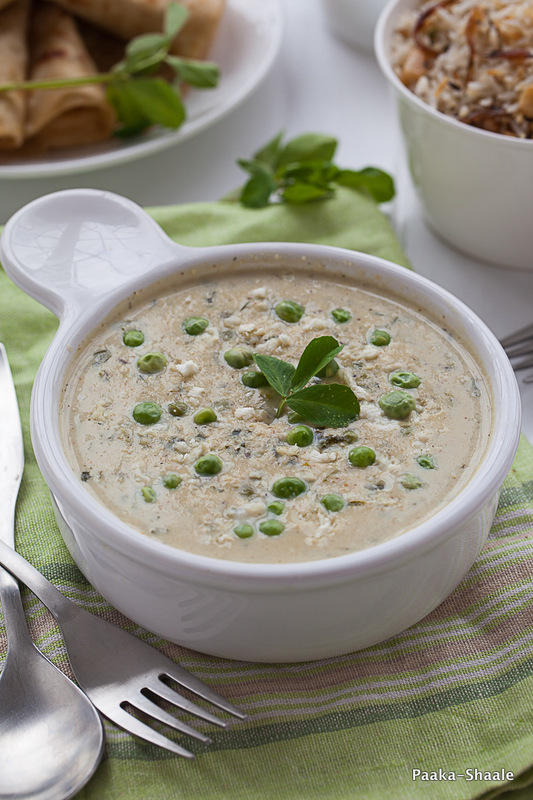 There are many recipes for the Methi Matar Malai on the web. But I just love the methi matar malai that is served in a restaurant near our house. In this restaurant's version, the fenugreek leaves and the peas are cooked in rich cashew nut and poppy seed gravy and then topped with cream. As if this wasn't enough there is also bits of paneer floating in the gravy. This version, is as rich as it can get!! 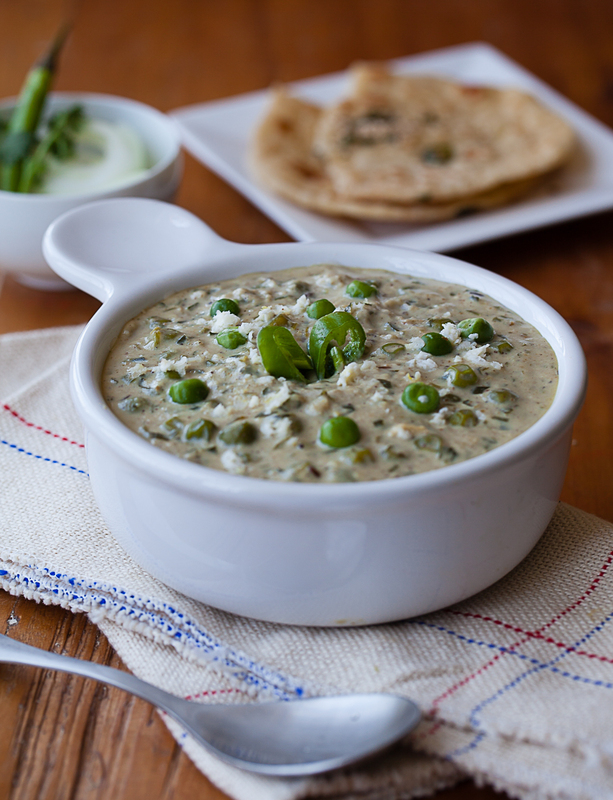 I normally make Methi Matar Malai during weekends or when I am entertaining. It's almost always a hit. 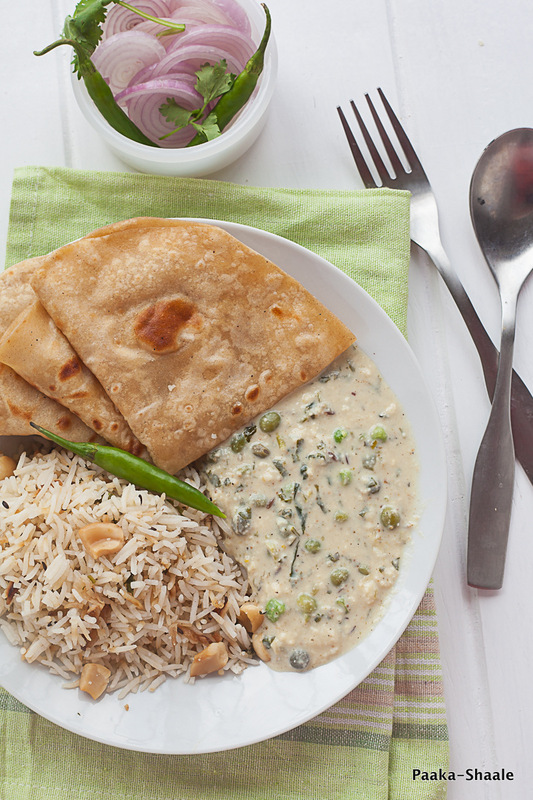 Just the thought of flaky Parathas with Methi matar malai can lead to culinary nirvana. Apart from Naan or Parathas, this creamy dish tastes great with Ghee rice or Jeera rice as well. 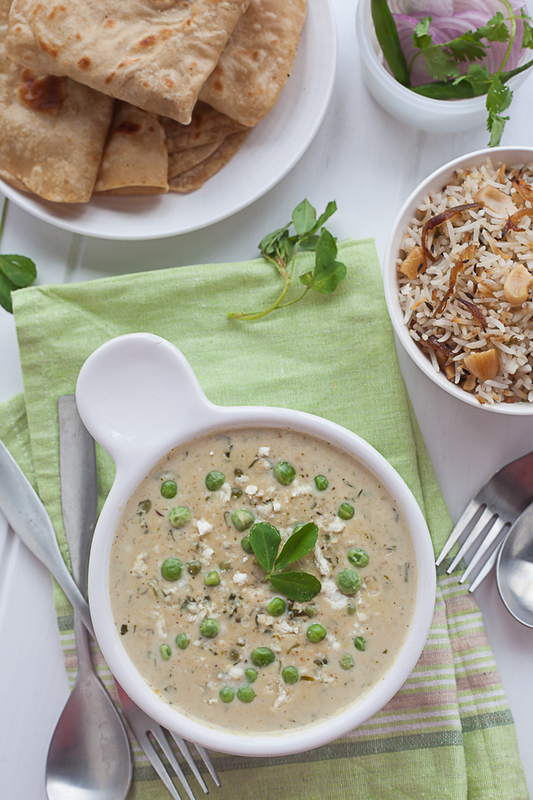 The combo of the fragrant rice with this creamy curry is just heavenly. 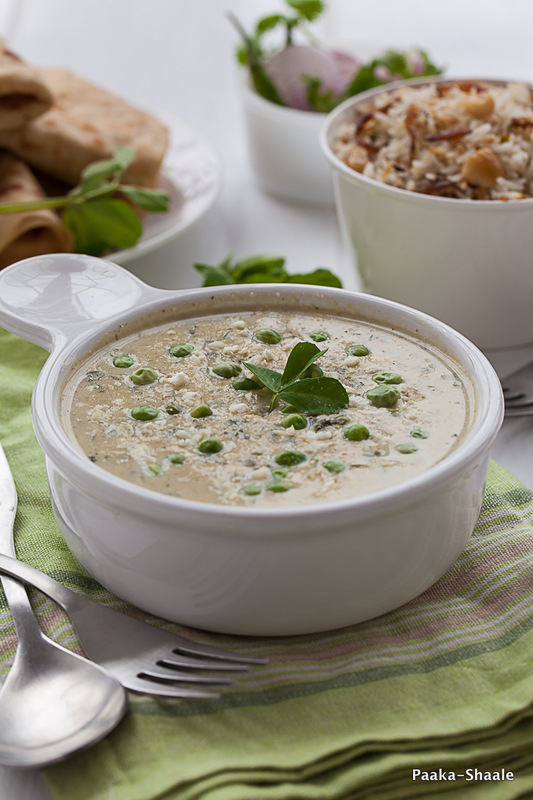 This version of Methi Matar Malai may seem tedious and time consuming. But I assure you, once you try this version, you will not have it any other way. It is that good!!! Poppy seeds- 1-1/2tsp, lightly toasted. Make a paste of ginger, garlic and green chili and keep aside. Blend the soaked cashew nuts along with the roasted poppy seed to a fine paste in a blender and set aside. Heat oil in a thick bottomed pan and add the ginger-garlic- green chili paste and fry till the raw smell goes. 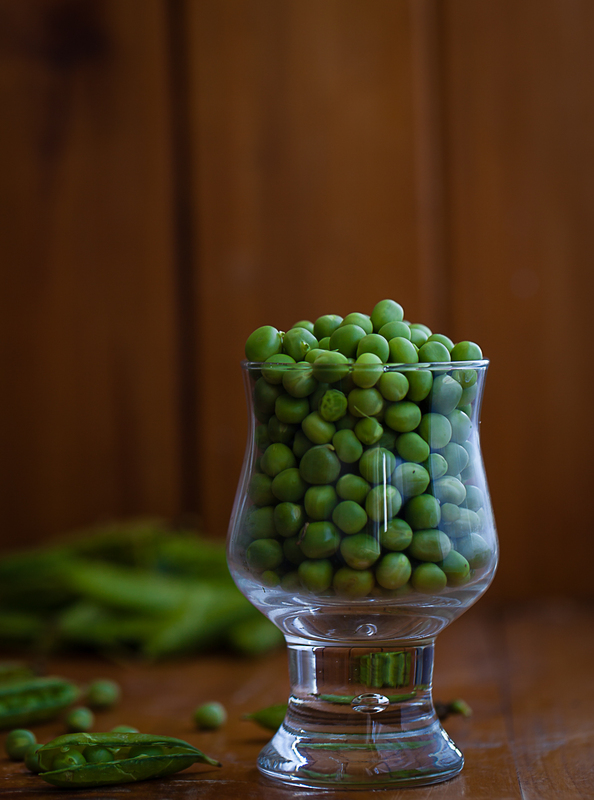 Add the chopped fenugreek leaves and the green peas and fry for 5mins. Stir in the onion puree and fry for two mins more. Add the salt, sugar, cumin-coriander seed powder, kasuri methi and mix well. Add the 1/4 cup of water to the mixture and cook covered for 4-5mins. After the peas are completely cooked add the cashew-poppy seed paste and mix well. Add milk and allow the mixture to simmer on low heat for 5mins. Stir in the cream and mix gently and take off the heat. Serve hot with parathas or rotis.